The mission of Love INC is to mobilize the Church to transform lives and communities In the Name of Christ. Love in the Name of Christ is a proven model that networks local churches, church volunteers, and community organizations togetehr to help people in need. Through Love INC, churches and individual Christians are mobilized to work together, across denominational lines, to provide coordinated help to the poor with basic needs such as food and clothing, to longer-term responses such as life skills training and transitional housing programs. Founded in 1977, today there are more than 140 Love INC affiliates in 30 states, representing a network of more than 9,000 churches, 6,000 community -based organizations, and 300,00 volunteers meeting mor ethan one million needs each year. The Love INC National Headquarters assists communities in developing new affiliates and supports existing affiliates by providing training, technical assistance, marketing materials, networking opportunities, and best practices. Existing resources operating independently are not adequate to meet current and growing levels of need. One church alone cannot deal with all of the complex issues of poverty. It takes churches working together, across denominational lines, to meet these multifaceted needs. The Love INC model has three levels. Each level goes deeper in fulfilling Love INC's mission to transform lives and communities In the Name of Christ. Level One: The Clearinghouse The Clearinghouse is the foundation of Love INC. Love INC receives requetss for help, screens the requests for extent of need and legitimacy, and refers the requests to a local church ministry, church volunteer, or community agency. Love INC follows up to ensure the need was met and to offer spiritual support. Through the Clearinhouse, Love INC also identifies gaps in services and resources in the community and helps churches develop ministries to "fill in the gaps" of needs not being met by covernment or agencies. Level Two: Relational Ministry Love INC helps individuals and famlies in chronic need make lasting changes in their lives. 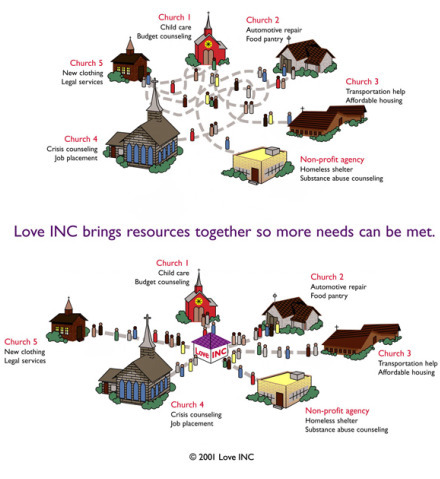 Through Relational Ministry, Love INC trains and links church members with people in need on a long-term basis to provide mentoring, goal setting, skills training, and spritual and emotional support, along with the full array of services and resources available through the Love INC network. Level Three: Comprehensive Community Development Love INC goes even further to meet the needs of communities by addressing the deeper issues that contribute to poverty and hopelessness, such aslack of affordable housing and health care resources. Love INC has over 30 years of experience mobilizing churches to meet the needs of its community, resulting in proven best practices. There are untapped resources in the Body of Christ that Love INC mobilizes on behalf of those in need. Love INC gives Christians specific, manageable opportunities to put their faith and love to work in the servcie of people in need. Love INC meets needs through loving relationships, and Scripture tells us that love never fails (1 Corinthians 13:8). People in need receive coordinated help through a network of church and community services adn resources. Churches model unity of the Body of Christ as they wrok together, across denominational lines, to fulfill their Biblical mandate to help the poor and needy. Church members receive opportunities to use their unique gifts and talents in specific, manageable ways to serve others. Community agencies refer people in need to Love INC to fill gaps in services, and receive referrals from Love INC of verified needs that are appropriate to the agency's services.